The 2015 Baseball World Series just ended a couple of days ago, and it was a huge turnout, especially for sportsbooks as two big rivals met on the final field, where the Kansas City Royals beat the New York Mets on the eighth game of the series. They won 7-2, giving them the ultimate victory, being World Series champions, something the franchise hadn’t experienced since their only other victory in 1985. 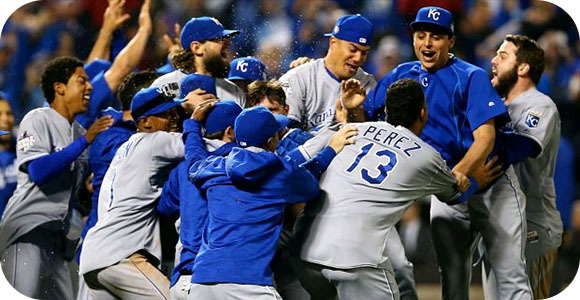 The Royals were the underdogs throughout this year, which is what led to many surprised fans and sports gamblers. Sportsbooks are taking a page out of the success this MLB season has brought them, especially with how the Chicago Cubs finally broke their curse and were able to go to the playoffs, although many believed they would make it to the World Series; as many Cubs fans say, “Next year!”. According to the books, they are actually giving the Cubs and the Royals pretty good future odds of getting to the 2016 World Series next season. We can already see the battle brewing between some of the teams that managed to make it to the playoffs this year, which will have almost the same lineup of players in the upcoming season, so we can all expect an equal level of performance from each team. Sportsbooks, online and in Las Vegas, are jumping at the chance to start getting wagers even before the MLB preseason begins. Some may get lucky enough and get a huge payout by the end of next season.